Do you need to know how to swim to snorkel? Snorkeling for beginners :: hawaii. caribbean cruise. florida keys. Do you need to know how to swim when you go snorkeling? Is it a very good idea to know how to swim when you go snorkeling? There’s a good chance that absolutely nothing will happen when you go snorkeling in the ocean even if you don’t know how to swim. But it’s still important to not underestimate the power of the open water. As with most outdoor activities, there are risks involved. Your ideal goal would be to minimize those risks. And in the case of snorkeling, there are a few things you can do to help yourself out. No matter how prepared you are, it won’t be possible to completely make it so there are no risks at all. But there are a lot of things that you can do to help you and your family have a safe snorkeling adventure. And a safe snorkeling adventure is what can lead to a FUN snorkeling adventure! A snorkeling disaster would be NO FUN at all! …and for that matter, these are some snorkeling tips for confident swimmers too! Even if you don’t know how to swim properly, you’ll want to be comfortable in the water. If you’re not comfortable in the water, then you won’t be comfortable snorkeling, which means snorkeling won’t be any fun! Even just one lesson can make a difference if your skill level for swimming is at a beginner level. It may be a bit much to ask to learn how to do the freestyle swim in a single lesson. But it may be worth it to have a swim lesson to learn how to do the breaststroke if don’t know how. The breaststroke can be a bit easier to pick up, and it could be a useful swimming stroke in snorkeling, since it’s about gliding through the water. It could also be useful to learn the proper way to kick if you’ll be wearing fins. Being able to kick efficiently means that you won’t be wasting unnecessary energy kicking as you move forward in the water. Of course, if you’re willing to invest a little more time and money, the more lessons the better! Look into taking a swim lesson at your local YMCA. It may be around $40, and consider it an investment as a part of your vacation budget! It’s to have more fun during your snorkeling trip! Or, if you want to practice a bit on your own, look into open swim hours at your local high school. Some high schools offer these open swim hours at their lap pool for less than $5 per swim. You may be able to take adult swimming lessons at the high school too. Note: If it’s your kids you’re taking snorkeling, definitely get them in for a batch of swimming lessons if they don’t know how to swim! And if you are headed to the pool, it may also be worth it to take your snorkeling gear along to get comfortable breathing with a snorkel too. Full-face snorkeling masks like this one can be considered beginner-friendly, because a standard snorkeling set like this one can take a bit more of an adjustment. But all the more reason to practice! It can be a NO GOOD combination if you’re struggling to breathe when you’re snorkeling and you don’t know how to swim. Here are some full-face snorkeling masks to consider. Or if you have a summer before your snorkeling vacation that will give you warmer temperatures, you can head to a local lake to get in some snorkeling practice in the calmer open water! Check to see if your nearby city parks or state parks have some lakes for swimming. 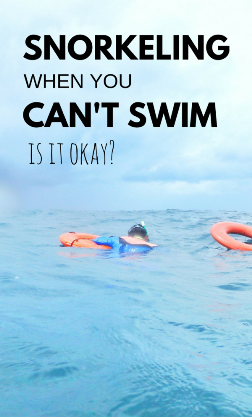 Confident swimmer or not, it’s good practice to not go swimming alone in the open water. This is even more true if you don’t know how to swim. Using the buddy system when you snorkel is an added layer of safety. This is more to do with keeping your comfort level high. The more comfortable you are, the more you’re bound to enjoy snorkeling! 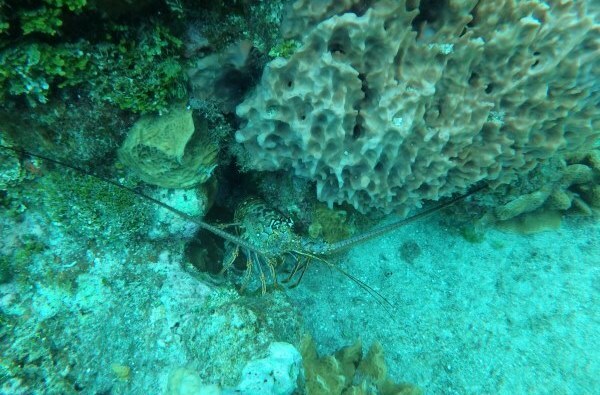 Depending on where your snorkeling destination is, you may be able to find beaches that offer some good snorkeling in shallow waters. In Hawaii, this can include Waikiki, Hanauma Bay, and Shark’s Cove. 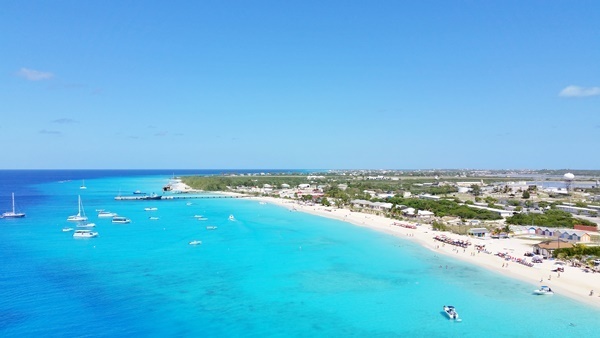 During a Caribbean cruise, there’s swimming with stingrays in Grand Cayman and snorkeling near the Grand Turk cruise port. But, don’t mistake shallow waters and calm waters for being completely safe. Always remember, the ocean can be powerful! If you don’t know how to swim, you definitely want to consider wearing a snorkel vest like this one. Not only will it help you to stay afloat while you’re snorkeling, when you need a little bit of a break, the vest can also bring you a little bit of relief. Consider wearing a vest even if you’ll be in shallow waters, because you never know how the ocean waters will act! Wearing snorkel fins is another thing that can provide an added level of security. They can help you to go further more easily. This means that you’ll be able to explore more without tiring as easily. And when you are not that confident in your swimming ability, you want all the help you can get! The only problem with fins really is that they take up a lot of space in your luggage. But if space is not an issue, then have a look to snorkeling fins like these. Otherwise, if you’re traveling to a snorkeling destination, you may be able to find a place that rents just fins. That way you can bring along the mask and snorkel that you’ve been practicing with and know how to use well, and then rent the fins when you get to the beach. In Hawaii, you can rent at Hanauma Bay and you can also rent at Shark’s Cove. 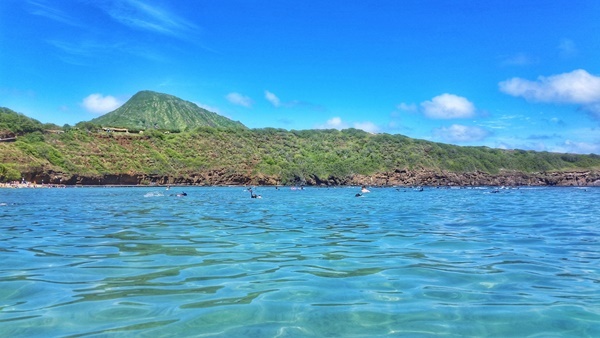 These are two of the most popular snorkeling beaches in Oahu. If you’re thinking about a snorkeling tour that takes you out on a boat in the middle of the ocean, that’s when you might want to think really hard about whether or not you want to go on that snorkeling tour. Even if right now sitting in your cozy home you’re thinking that you won’t have anxiety from being out in the open water, when you actually get out there, it could be a whole different story. If you don’t know how to swim, you might become really anxious seeing all the water around you and not being able to stand up. With this state of mind, you might find it difficult to concentrate on what you should be concentrating on during a snorkeling tour – seeing that colorful school of fish down below! But, if you prepare ahead of time (like taking those swimming lessons!) you just may find yourself loving it jumping off the boat and into the ocean to find that lobster! Again, the ocean is powerful! While some beaches have a greater risk for rip currents, even if you’re at a beach with a lower risk, it’s still possible for there to be a rip current. That’s why you should read this. The main thing to remember: DON’T FIGHT IT! When a rip current is taking you away from shore, it will be tempting to try to swim towards shore. But for your best chance of survival, let the current take you away. 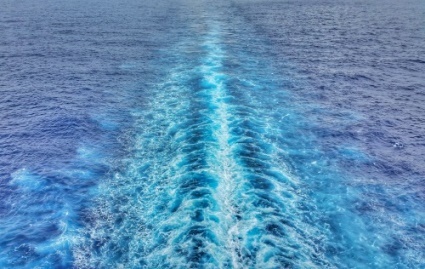 Then once you’re out of the current’s path, you can more easily head back to shore without wasting more energy than necessary. Fighting the current requires energy and can quickly exhaust you. Be safe out there when snorkeling! On that note, snorkeling is fun! It’s just important that you also are aware of the risks, whether you’re a confident swimmer or you don’t know how to swim at all. Now here are some things you might want to consider packing for your beach vacation! These types of UV protection shirts to wear so you don’t burn under the strong tropical sun rays when you’re in the water! You’ll find shirts for women, men, and kids, so have a look! These types of beach shoes if you’re not wearing fins so that you can protect your feet from sharp rocks hidden under the sand on the beach and in the water!